This year we are offering Mary's Free-Range turkeys for your Thanksgiving dinner. These birds are certified organic, free-range, non-GMO verified, and completely drug free! They weigh in at 8-12 pounds and are priced at $6.25/pound. 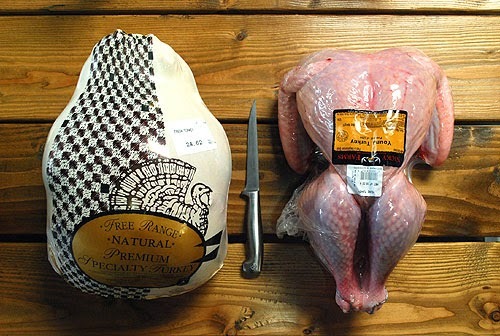 We also have a few non-GMO turkeys from Mary's that weigh 12-16 pounds at $4.95/pound. Please call us at 503-580-2936 to reserve your turkey. We require a $25 deposit, with the remaining balance due when you pick up. We expect the birds to arrive fresh on the Tuesday before Thanksgiving. If turkey is not your thing, we also have Grass-Fed Beef Chuck Roasts and Briskets, Pork Briskets, Smoked Hams, and Grass-Fed Lamb Osso Buco available! Just let us know if you'd like to reserve something.